Objections to the MLA Boycott resolution uniformly focus on its supposed abridgement of academic freedom to individual scholars in the US or in Israel without any concern for the educational rights of Palestinians. Purposefully obfuscating the case, critics of the boycott resolution brush past the resolution’s declaration that the boycott is against institutions, not individuals. Anti-boycott arguments claim that all faculty in Israel-Palestine are tied to state institutions because Israeli universities operate under the aegis of the state. However, academic boycott guidelines stipulate clearly that only individual scholars who openly identify themselves as representing the State who are, by dint of that identification, subject to the boycott. In making that identification, those scholars are in fact declaring their support of Israel’s violations of Palestinian rights. The boycott is an act of non-violent resistance to a situation of global injustice. A major document has been produced that provides vivid accounts of conditions faced by Palestinians: the voices of Palestinians. Rather than focusing on the harms that might befall a Jewish Israeli scholar, this dossier of Palestinian accounts documents the actual, existing, and constantly repeated harms to Palestinian scholars—harms that go far beyond not being able to attend a conference. As one of the contributors reminds us, the International Covenant on Economic, Social, and Cultural Rights describes education to be “both a human right in itself and an indispensable means of realizing other human rights.” The Israeli occupation stands in the way of Palestinian rights to education, and it also stands in the way of other fundamental human rights. As scholars of the humanities, it certainly behooves us to listen to these Palestinian voices carefully, and to honor their call for solidarity. During its annual conference that will take place January 5-8 2017, the Modern Language Association will consider and engage in debate regarding two resolutions. One resolution calls for the MLA to endorse the boycott of Israeli academic institutions and support the work of the Boycott, Divestment and Sanctions (BDS) movement. The other resolution asks that the MLA not boycott Israeli institutions. If either of the resolutions passes, the resolution will be voted on by the whole MLA membership in 2017. Canadian members of the MLA may think that they do not need to be involved in the fight between pro and anti BDS groups, because Canada is not involved in support for Israel to the same extent that the United States is, and because the Canadian government and civil society does not take as a hard a line against BDS activism on university campuses and elsewhere. On December 23, 2016, the UN Security Council passed UN Resolution 2334 condemning Israel’s illegal settlements, currently home to over 600,000 Jewish settlers. The resolution is an affirmation of international law, and the first resolution the Security Council has adopted on Israel and the Palestinians in nearly eight years. Although not legally binding, it is nonetheless important measure. UN 2334 works in tandem with grassroots organizing by the international community supporting the non-violent Palestinian-led call for Boycott, Divestment, and Sanctions until Israel complies with international law—a movement MLA Members for Justice in Palestine seek to support with an academic boycott resolution that will be presented fo r a vote this January at the Delegate Assembly. In an editorial in the Israeli newspaper Haaretz, journalist Gideon Levy calls UN Resolution 2334 “a gust of good news, a breath of hope in the sea of darkness and despair of recent years.” Gideon also states, “Resolution 2334 is meant above all for Israeli ears, like an alarm clock that makes sure to wake you up on time, like a siren that tells you to go down to the bomb shelter.” This wake-up call, like the MLA Boycott resolution, offers a non-violent and powerful way to contest Israel’s human rights violations. As we enter a new year, the MLA Boycott resolution affords MLA members an opportunity to insist that Palestinians be afforded their human rights, including the right to education and academic freedom. Please try to attend as many of these as you can and bring anyone who will join you: we want to create a sense of supportive buzz and swell prior to the Delegate Assembly (DA) meeting. The DA only allows delegates to vote on the resolution, but any member present can speak to the issue, and in other associations the presence of supportive members has proven to be very effective in encouraging a vote in favor of the resolution. JOIN THE MLA or MAKE SURE YOU HAVE RENEWED BY JANUARY 4, 2017! SHOW UP AT THE TOWN HALL AND SPEAK OUT! MOST IMPORTANT: SHOW UP AT THE DELEGATE ASSEMBLY HEARING ON SATURDAY AND SPEAK OUT! Check out the new MLA Members for Justice in Palestine video. 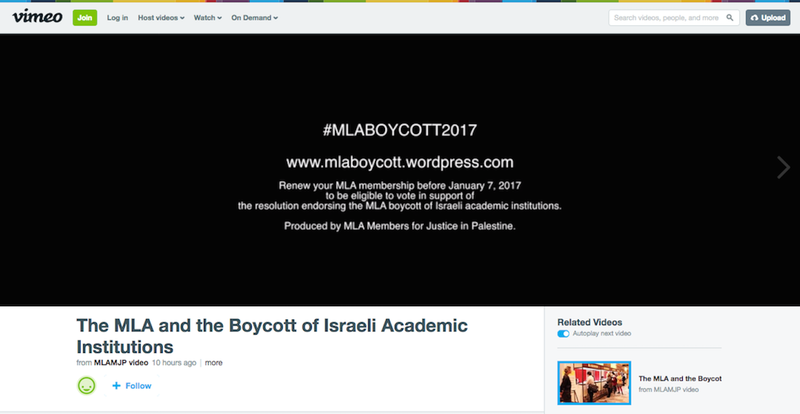 The short documentary (7.5 minutes) makes the case for MLA members to vote in 2017 in support of a resolution to endorse the boycott of Israeli academic institutions. Scholars call on the MLA to make a commitment to Palestinian rights to education and academic freedom. They emphasize the dire conditions of Palestinians living under Israeli rule. The video includes interviews with numerous prominent literary scholars who support the boycott resolution. Gayatri Spivak, W.J.T.Mitchell, Bruce Robbins, Margaret Ferguson, Rosaura Sanchez, David Lloyd, Malini Schueller, David Palumbo Liu, Jeffery Sacks, Koritha Mitchell, Kenneth Surin and Kamran Rastegar are among the scholars interviewed. The interviews were conducted at the 2016 MLA Convention in Austin, Texas. The video ends with reminder that you must renew your MLA membership by January 7, 2017 to be eligible to vote on resolutions passed by the Delegate Assembly in 2017. Support Palestinian rights to education! Rebecca Comay and David Lloyd wrote the op ed piece below, explaining the importance of the academic boycott resolution that they have submitted to the MLA for a vote at the Delegate Assembly when it meets on January 7 in Philadelphia. The op ed encourages MLA members to “respond to the call” of Palestinian civil society and endorse the boycott of Israeli academic institutions. Comay and Lloyd contextualize the coming Delegate Assembly vote on the resolution in terms of US politics in general and the 2016 presidential election results. They write: “There is no doubt that Trump’s administration will give its fullest support to the nation whose worst aspects he has praised as a model for his own intended policies.” They conclude by emphasizing the established ethical principles that underwrite the MLA and the political reasons for MLA members to stand in solidarity with Palestinians. Certainly, Trump’s campaign rhetoric was unrelentingly supportive not only of Israel’s right to exist, but also of its most racist and draconian policies, from racial profiling to the notorious apartheid wall. There is no doubt that Trump’s administration will give its fullest support to the nation whose worst aspects he has praised as a model for his own intended policies. The coming years promise to be even more difficult times for the Palestinian population living under brutal conditions of blockade and occupation, and for those Palestinian citizens of Israel who must negotiate a discriminatory state with its numerous laws that continue to disadvantage and dispossess them. The boycott seeks to break the impasse that has been enabled by the ongoing reluctance of governments internationally to sanction Israel’s violations of law and human rights. The immobility of the global political establishment can only be countered by a global civil society that responds to the Palestinian call and acts upon it.